A beautiful, fun campground overlooking the Thunder Bay River. This great site offers both rustic camping and RV campsites with hot shower, a boat launch, laundry facilities, full hook-up, picnic tables, firewood, a dumping station, modern restrooms, and cable hook ups. An indoor heated pool, sauna, TV lounge, game room, mini golf, stocked fishing pond, shuffleboard, play ground and awesome fishing are just a few of the great opportunities for fun. 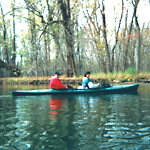 Canoes, kayaks, fishing boars, pontoon boats, paddleboats, bikes, camping trailers and tents are all available for rent.